Obamacare . . . is a fight conservatives couldn’t walk away from even if they wanted to, because health policy is absolutely central to the struggle over the size and scope of governmental power. If Obamacare remains on the books, the federal government will become the dominant actor in nearly one-fifth of the American economy, tens of millions more Americans will become dependent on taxpayer support for their health care, the quality of American medicine will decline, and the spending commitments in the law will increase the pressure for ever-higher taxes—even as they add to the risk of national insolvency. So the fight must go on. The only question, at this point, is how to proceed. 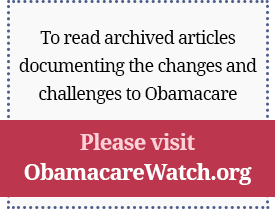 First, congressional Republicans should push for a delay in Obamacare’s implementation. Second, the party should unite behind, and persuasively advance, a credible and practical replacement plan—for one cannot replace Obamacare without offering a replacement. According to estimates produced by one of us and former Congressional Budget Office director Douglas Holtz-Eakin, simply delaying the implementation of Obamacare by two years (until January 2016) would cut deficits by about $200 billion. . . . This would be a popular pitch for Republicans to make to the American people: We will cut the deficit by $200 billion and will also keep you from having to live under Obamacare for another two years. That’s a win-win for the American people. As such, it’s a pitch congressional Republicans should make—and it’s a price its members should make Obama pay to get what he wants in the budget process. Delaying the implementation of Obamacare would be important for three reasons: It would save hundreds of billions of dollars in federal spending. It would spare Americans from having their health care premiums spike until a somewhat later date. And it would move the onset of Obamacare much closer to the 2016 presidential election, which would put Obama’s centerpiece legislation at center stage in that race—as the future health of the nation demands that it be. A credible alternative to Obamacare must start with a plan to address the issue of preexisting conditions. Of course, to stay continuously insured, families need to have realistic and affordable options. This, in turn, requires fixing the unfairness in the tax code. Such reforms would also reinforce a third element of a credible replacement program: a move away from open-ended health-care subsidization by the federal government. Capretta and Anderson argue that “if Republicans were to advance a replacement along these lines — a plan that would provide stable insurance options, consumer choice, and high-quality health care without the heavy-handed mandates and regulations of Obamacare — the American people would be more than happy to throw Obamacare overboard. “The key to turning back the singular threat that Obamacare poses to our liberty and fiscal solvency is for the GOP to have a plan of attack that extends across the next four or five years,” they conclude. Reading the whole piece is well worth your time in fleshing out the details of this wise and workable strategy. Posted on National Review Online: The Corner, January 29, 2013. Obamacare…is a fight conservatives couldn’t walk away from even if they wanted to, because health policy is absolutely central to the struggle over the size and scope of governmental power. If Obamacare remains on the books, the federal government will become the dominant actor in nearly one-fifth of the American economy, tens of millions more Americans will become dependent on taxpayer support for their health care, the quality of American medicine will decline, and the spending commitments in the law will increase the pressure for ever-higher taxes—even as they add to the risk of national insolvency. According to estimates produced by one of us and former Congressional Budget Office director Douglas Holtz-Eakin, simply delaying the implementation of Obamacare by two years (until January 2016) would cut deficits by about $200 billion. …This would be a popular pitch for Republicans to make to the American people: We will cut the deficit by $200 billion and will also keep you from having to live under Obamacare for another two years. That’s a win-win for the American people. As such, it’s a pitch congressional Republicans should make—and it’s a price its members should make Obama pay to get what he wants in the budget process. Such reforms would also reinforce a third element of a credible replacement program: a move away from open-ended health care subsidization by the federal government. Capretta and Anderson argue that “If Republicans were to advance a replacement along these lines—a plan that would provide stable insurance options, consumer choice, and high-quality health care without the heavy-handed mandates and regulations of Obamacare—the American people would be more than happy to throw Obamacare overboard.